Read our full JBL Pebbles review. 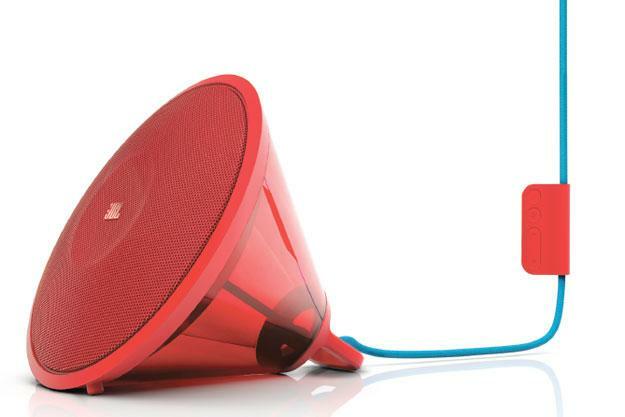 JBL is bringing some style to IFA this year with two funky new desktop speaker models. The colorful new entries are being unveiled at the electronics show later this week, but for those who can’t make it to Berlin, here’s the lowdown on each of them. Looking like a cross between a tape measure and a set of snow tires, the $60 Pebbles are USB powered speakers designed to bring some flair to the desktop. The pint size speakers sport 50mm drivers and are powered through JBL’s DSP and Slipstream Technology to cover a claimed frequency range of 80Hz-20kHz. Additional features include an on-board volume dial which syncs to your computer and a 3.5mm Aux input. The Pebbles will be available in a wide range of colors later this month. The $130 Spark borrows a page from the funnel-shaped Joey Roth Ceramic speakers we reviewed a while back, adding its own unique touches to the design. The speaker’s translucent plastic casing is available in a stream of flashy colors, and it sports some distinctive features like a stainless steel hook at the back for hanging it up, as well as an in-line control pad along its fabric power cable. Inside the Spark’s megaphone frames are twin 40mm stereo drivers with a claimed frequency range of 76Hz-20kHz. The speaker connects via Bluetooth, but unfortunately offers no battery option, limiting its portability in comparison with similarly priced speakers in the segment. Like the Pebbles, the Spark will be available for purchase later this month.